With the 2018 WHL Playoffs set to begin Thursday, March 22, WHL.ca provides a look in at each of the eight head-to-head matchups across the league. In our fifth of eight opening round 2018 WHL Playoffs previews, we examine the Swift Current Broncos and Regina Pats. One short year ago, the upstart Swift Current Broncos and 2016-17 WHL Regular Season Champion Regina Pats treated WHL fans to an electrifying second round series, one which saw the Pats erase a 3-1 deficit to triumph in seven games and eventually advancing to the 2017 WHL Championship Series. Just last weekend, fans in both Speedy Creek and the Queen City were treated to a little preview of what’s to come in 2018 – and, folks, what’s in store this season just might be better than what had us all on the edge of our seats last season. 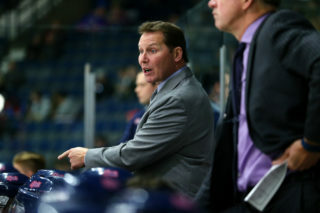 Last Friday in Regina, the Pats scored a 3-2 overtime victory in what was a physical, back-and-forth affair. If you went to the Brandt Centre hoping for some heavy hitting and exciting hockey, chances are you did not leave disappointed. The following night in Swift Current, it was the Broncos registering a 3-2 overtime victory in what was, in so many ways, a repeat of Friday… but arguably on steroids. Even more physicality, even more speed, even more excitement. Here’s hoping that the jets have not cooled over the past week, because, boy oh boy, last weekend was incredible. If these two teams were battling to establish a tone for this series, they succeeded. And whatever comes next absolutely will not disappoint. Glenn Gawdin (56-69–125) gave it a good run and nearly kept pace with Jayden Halbgewachs for the WHL scoring title. Regardless, the Calgary Flames prospect is the heart and soul of this Broncos squad. He’s joined up front with a corral full of deadly weapons, including Florida Panthers prospect Aleksi Heponiemi, Arizona Coyotes prospect Tyler Steenbergen, along with overagers Giorgio Estephan and Matteo Gennaro. 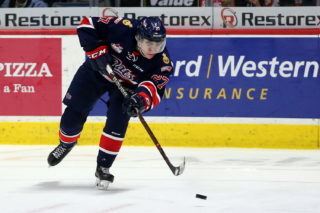 On the opposite side, 2017 WHL Player of the Year Sam Steel guides the Pats with the help of Edmonton Oilers prospect Cameron Hebig, overage forward Matt Bradley, Anaheim Ducks prospect Josh Mahura, Montreal Canadiens prospect Cale Fleury and New York Rangers prospect Libor Hajek. Folks, buckle up. This is going to be a wild ride. We want more! @SCBroncos & @WHLPats to renew hostilities in first round of 2018 #WHLPlayoffs! Game 7* – Monday, April 2 – Innovation Credit Union i-Plex – Swift Current – 7 p.m.
Beefy blueline: Sahvan Khaira stands 6-foot-4 and 220 pounds. Josh Anderson sizes up at 6-foot-3 and 220 pounds. Noah King hovers at 6-foot-4 and 200 pounds. Both coming in at 6-foot-2, you might almost think Artyom Minulin and Colby Sissons were small in comparison with the aforementioned. All this adds up to one thing – that Swift Current defence is not much fun to deal with. They’ve got reach and range, they can skate and if you aren’t careful, Sissons and Minulin will jump into the rush and burn you. While we’re on that subject, 17-year-old rookie Jacson Alexander is smooth skating and agile as well. At 5-foot-9, he might not strike fear into opponents, but the kid is mobile and sneaky good for a youngster. Depth of Experience: Let’s face it, nothing quite compares with having been to the big dance. The Regina Pats fell just short of the ultimate run in 2017, suffering a six-game defeat at the hands of the Seattle Thunderbirds. But in bitter disappointment there are lessons to be learned. Captain Sam Steel leads the charge up front while reliable two-way blueliner Josh Mahura patrols the backend and you know both these Anaheim Ducks prospects are hungry for redemption in 2018. 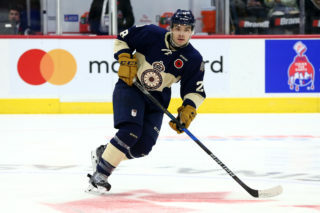 Robbie Holmes, Nick Henry and Liam Schioler were there in 2017, while the Pats were without the services of Jake Leschyshyn during last year’s run. He is healthy and looking to contribute. LW Beck Malenstyn (17-15–32): Coming to Speedy Creek as a part of the deal that landed Matteo Gennaro prior to Christmas, Malenstyn has quietly put together a quality season after missing some early time due to injury. With 29 points (17G-12A) in 38 games with the Broncos, the 20-year-old veteran product of Delta, B.C. brings a great blend of grit and finish. Last time we checked, that’s the kind of stuff that gets it done in big-game scenarios. 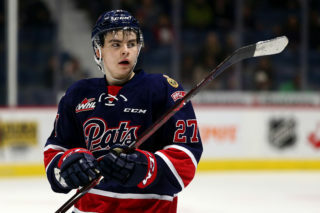 LW Jesse Gabrielle (13-6–19): Perhaps one of the most surprising names moved at the WHL Trade Deadline, the Pats reacquired the 20-year-old Boston Bruins’ prospect from the Prince George Cougars. Following the deal, the product of Moosomin, Sask. returned to the WHL after having started the campaign with the AHL’s Providence Bruins. The enigmatic winger scored what very well could be one of the most exciting goals of the 2017-18 WHL Regular Season during the final week of the campaign. He has speed to burn and a great goal-scorers finish. The biggest bugaboo against Gabrielle is his discipline – or lack thereof. The Pats are going to require all the offense they can get from the 6-foot, 205-pound forward, and for him to do that, he’s going to need to be on the ice and not in the penalty box. Go figure. Jacson Alexander (1-4–5): It was a very Merry Christmas for the Swift Current Broncos when the 2001-born Alexander signed a WHL Standard Player Agreement on December 22. A former first-round bantam draft selection (17th overall, 2016), the 5-foot-9 product of Victoria, B.C. began the season with his hometown Victoria Grizzlies of the BCHL, where he posted nine points (3G-6A) in 29 outings. While not being leaned on heavily as part of a veteran blueline brigade now that he is Swift Current, there is no questioning Alexander’s ability and potential. Aaron Hyman (3-10–13): Remember we were talking about the value in experience earlier? Well, Hyman brings a certain experience to the table that no other Pat can say they have. Acquired by Regina ahead of the 2018 WHL Trade Deadline, the 6-foot-5, 221-pound product of Calgary came to the Queen City from Seattle, where he was previously a member of the 2016 WHL Champion Thunderbirds. He won’t blind you with flashy play or speed but Hyman has proven to be about as steady as they come from the blueline. With a safe first pass out of the zone and solid positional play in his own end, reliable defencemen like Hyman are the ones who allow others like Mahura, Cale Fleury and Libor Hajek to roam around and jump into the play from time to time. Stuart Skinner (56 GP, 30-21-3-1, 3.07 GAA, .905 SV%, 6 SO): Splitting the season between the Broncos and the Lethbridge Hurricanes, the Edmonton Oilers prospect is hoping to take one step further – at the very least – than he did in 2017. 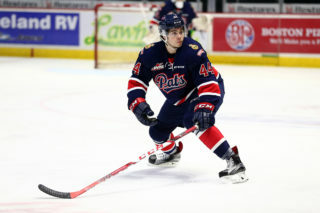 Skinner’s Hurricanes fell in six games to the Pats in the WHL’s Eastern Conference Championship and if the 6-foot-4, 200-pound product of Edmonton has any hopes of returning to the Eastern Conference Championship in 2018, he will need to get past those same Pats, but this time in the first round. In 25 games since arriving in the Land of Living Skies, the towering netminder has gone 16-6-1-1 with a 2.68 GAA, .914 SV% and two shutouts. Not too shabby. Max Paddock (33 GP, 19-7-1-1, .2.90 GAA, .904 SV%): After opening the year with overager Tyler Brown in the starter’s role and Paddock serving as backup, the Pats went out and exchange Brown in a deal that brought 1998-born Ryan Kubic to town. Having battled injuries all year long in Saskatoon, Kubic has had some similar troubles since arriving in Regina. In the meantime, the 17-year-old Paddock has shown he might be the one capable of carrying the load. While his regular season numbers are quality, the post-season is a different beast and the product of Brandon, Man., has yet to see a WHL crease during the playoffs. In 2017, the upstart Broncos knocked off the Moose Jaw Warriors in the opening round of action before jumping out in front of the Pats by a 3-1 margin – putting a serious scare into the 2016-17 regular season champs – before eventually bowing out. Having owned the 2017-18 regular season series with Regina, the Broncos will be looking for more when the 2018 WHL Playoffs open. There’s been a long WHL Championship drought in Saskatchewan – 25 years long, in fact. Interestingly enough, the last Saskatchewan-based WHL Club to win the WHL title was the Swift Current Broncos back in 1993. There’s a very real chance that drought could end in 2018 and don’t be surprised if the Broncos are the ones to do it. The 2017 WHL Championship Series saw a battered and bruised Pats squad fall to the Seattle Thunderbirds in six games. In 2018, the Pats celebrate their 100th anniversary season, while also playing host to the CHL’s 100th Mastercard Memorial Cup in May. Every host wants to win its way into the tournament, but that is going to be a tall task this spring when considering the likes of the Broncos and the Moose Jaw Warriors in the Eastern Conference alone. The Pats last WHL Championship came in 1980. Though not the favourites this year as they were last, don’t count this group out in what should be a tightly-contested Eastern Conference battle.